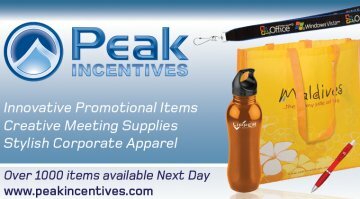 Peak Incentives Promotional Products from Virginia. VA Promotional Products Do you need promotional products fast? Peak Incentives is proud to offer over 500 promotional items available in 24 hours. Place your order today and we'll ship your order tomorrow with no additional charges. No Fees - No Rush Charges -- Its That Easy! Our 24 Hour service is the fastest in the industry. Give us a call today and ask how we can help with your last minute project. Touch Screen Gloves Under $15  If you own a smart phone or tablet, youll want a pair of our texting gloves. Our Texting Gloves are guaranteed to work on all of your touch screen devices. And for a limited time, you can get them for under $15 (with free shipping). Our gloves are the only gloves on the market that can perform complex gesture commands  not just two finger texting. Want to see a demo? Need embroidered emblems or patches? Our embroidered emblems are the perfect way to show off your corporate identity. Extremely durable and just plain beautiful, our embroidered emblems provide a cost efficient, high exposure, marketing tool designed to compliment your companys advertising campaign. We help build and support online business communities. We partnership with other business organizations. We don't need sophisticated technology and infrastructure to build our online communities, we just seek and find honest team players to work with. We partner with other website designers and promoters to provide you comprehensive website design, development and promotion for companies and organizations. We approach VA website design and website promotio VA as a team effort. Through these alliances weve been able to collaborate together to deliver valuable services and support to our business clients. For a free consultation please call Mark Barreres at 540-984-8190.